Laser-induced time-resolved luminescence spectroscopy was applied to the study of kyanite luminescence to clarify the origin of well known, narrow emission lines with long decay times. 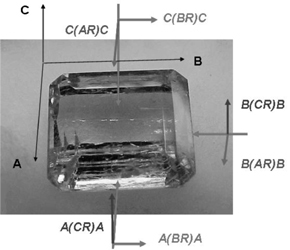 Based on kinetic and polarized luminescence experiments, it is proposed that they are connected to transitions from the 2Eg and 2T1 levels of a Cr3+ luminescence center in a site of intermediate crystal field strength within the kyanite structure. It contradicts the generally accepted interpretation that they are transitions from a split 2Eg level of a Cr3+ luminescence center in a strong crystal field position. Some ideas are presented on the origin of narrow lines with short decay times and broad luminescence bands.